In-town Oxford with Waterfront Location and Lots of Extras! Debating between staying in the village or on the water? Town Creek Haven provides the charm of in-town living and the beauty of waterfront living. Walk to the Scottish Highland Creamery, pull a kayak over to the Strand Beach, or simply sit on your back porch and wait for the crabs to enter the trap off of your private, deep water dock. You’ll get the best of the Eastern Shore! Located on The Strand, Town Creek Haven guests have water views from all rooms: Town Creek to the southeast and the Tred Avon River to the northwest. Walk or bike to Oxford’s quaint markets, restaurants and parks. This super comfortable retreat offers open concept living spaces with en suite bathrooms, providing privacy yet togetherness in one package. We love the game room with the foosball and shuffleboard table--it's hard to believe, but the property owner handcrafted both of these items in addition to the beautiful wooden whale above the fireplace mantel. Town Creek Haven is nestled in the historic district of Oxford but was built in 2002 and includes all modern upgrades. It’s the perfect size for couples' getaways, girls' weekends and family vacations. If and when you are ready to venture out of Oxford, take a ride on the Oxford Bellevue Ferry over to St. Michaels and enjoy the town’s restaurants and attractions. Easton is also a short drive away, where you can enjoy live music at the Avalon Theater or dinner at one of the many fabulous restaurants. If you do decide to soak in all that Oxford has to offer, you’ll find the neighbors here welcoming and you will love that you can throw your car keys in the kitchen drawer and not have to drive anywhere (unless you want to). Between the historic Robert Morris Inn, waterfront Capsize and Doc's Sunset Grille, plus the award-winning Pope's Tavern in the Oxford Inn, you really don't have to venture outside of town for a perfect meal. Take advantage of its availability by giving us a call to make it your own. Grill: This property has a charcoal grill/smoker. Charcoal and lighter fluid is the responsibility of the guest. Great service. Houses are well-chosen, and immaculate upon check-in. Staff is courteous and helpful with all requests. Perfect quiet and lovely location. House has it all. The houses we have rented are always clean and in great condition upon arrival. 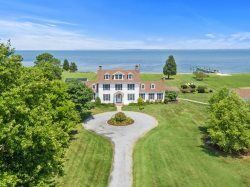 A wonderful vacation house, in a secluded and lovely water view part of enchanting Oxford, Maryland. Everything about this experience was fantastic! The house was everything we could have hoped for, beautiful, relaxing, comfortable and water everywhere you look! [ESVR] did everything to make check in and check out a breeze and when we had a question, they were available to assist us. I hope to be back! Best house ever!!! Cannot wait until next year. Your team is always great to work with. Jessica always a big help. We liked it so much we have rented again for next year. They were terrific, helpful, and very empathetic. We've already signed up for a week for next summer! Loved this house. We had a great weekend. The house exceeded all of our expectations. The screened in porch was wonderful and the kayaks, bicycles, and other amenities made for a great time. The location was also great.